In a year that witnessed the start of the First World War, the opening of the Panama Canal and the first transcontinental telephone conversation, on Dec. 30, 1914, a woman in La Conner, Washington, welcomed into the world her fifth child, Mary. Mary would become the middle child of nine siblings. Today, she and her younger brother, 85-year-old Bob Wall of Omak, are the remaining living children of their parents, John and Lillian Wall. 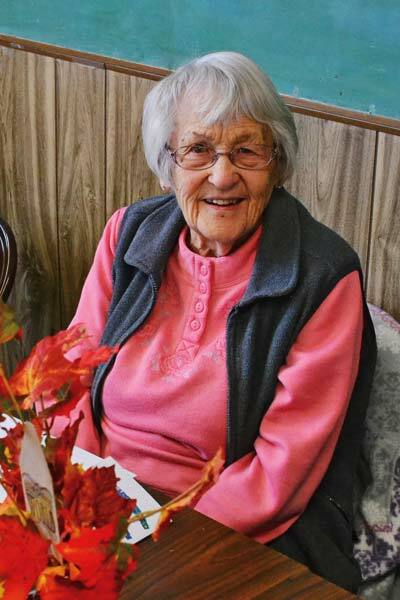 Mary Wall Bean turns 100 next Tuesday, and the community is invited to a birthday bash for her on Saturday (Dec. 27). The party will be held at the Methow Valley Community Center in Twisp from 1 – 4 p.m., with food and beverages, music by the Hottell Ragtime Band, dancing and birthday cake. All are welcome, but Mary asks that there be no gifts, please. When Mary was 3 years old, her family moved from La Conner to a homestead on Omak Mountain, and “tried to ranch,” Mary said. “It was so dry my dad had to work at Biles-Coleman lumber mill in Omak,” she recalled. Not long after, the family moved to “the Emory place,” in Omak, a dairy farm just north of where the hospital is now, Mary said. Mary attended the Omak School but never graduated, instead marrying Kenneth Schmidt in 1933. They had two daughters, Carol and Jo, but the marriage ended when Schmidt died “quite young,” Mary said. She met Russell Bean while working as an apple picker at the B&O Orchard near Okanogan. They married in 1958, and Mary and the girls joined Russell in their first home in Twisp, located where Aero Methow Rescue Service is now. The Beans bought Idle-a-While Motel in 1963, which had only the cabins at the time, Mary said. They ran the motel for more than a decade, and added the eight units on the south end, Mary said. Mary recalls the opening of the North-Cross State Highway in 1972 as “a big event. It brought a lot more people to the valley and business picked up. We were always quite busy,” she said. The Beans sold the motel business to Dave Schulz and retired, moving up to the house on Bigelow Street where Mary still lives. Russell passed away in 1978. “Mom has always worked very hard all her life,” said daughter Carol Monroe, who lives near Cle Elum, Washington. “She’s a busy lady. Try to call her on the phone and she’s never home,” Carol added. Carol recalled Mary’s days as a “milk lady,” before they moved to Twisp, driving a milk route “all over the county” for a dairy in Riverside, Washington. Mary still drives her car to a full slate of activities and volunteer jobs around Twisp, “but only in the day time,” she said. She goes to church on Sunday, having been a member of St. Genevieve’s Catholic Church “ever since I lived here,” she said, and plays bridge with friends every Friday and every other Monday. Luncheon buddy Pat Sigler has been a friend of Mary’s for nearly 40 years. “We have golfed together and bowled together; it’s been a total joy,” Pat said. Pat particularly noted Mary’s predilection for practical jokes: “She comes up with some doozeys,” she said. Daughter Jo Doyle, who lives near Chehalis, Washington, said “I’m just so proud of my mother because she’s such a goer and a doer.” Jo said she and her husband starting letting people know about the 100th birthday party last January, so that relatives as far away as Oregon and California could plan for it. Mary’s daughters and their spouses are in town to spend the week with their mom, and Mary’s 10 grandchildren “all hope to come” to the party, she said. She also has 27 great-grandchildren and 10 great-great-grandchildren whom she hopes to see. “I’m the most fortunate person in the world. I have a great family and lots of friends,” said Mary.